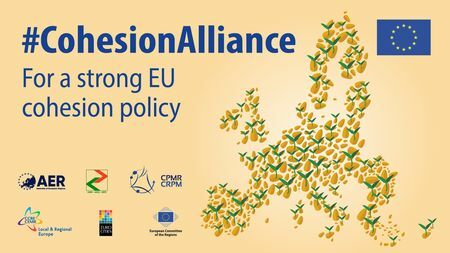 The CPMR is joining forces with the European Committee of the Regions (CoR) and leading territorial associations for the Cohesion Alliance, a collaboration to promote a strong Cohesion Policy beyond 2020. Discussions regarding the shape of the future Multi-Financial Framework (MFF) are underway, so regional and local authorities have come together to make sure that their call is heard loud and clear for a more effective, visible Cohesion policy for all regions. This initiative will be officially launched on 9 October, during the opening day of the European Week of Regions and Cities, through a dedicated Cohesion Alliance website and a social media campaign. Regions, cities, SMEs, NGOs and other organisations who are convinced of the benefits of Cohesion Policy will be invited to sign an online petition on the website, conveying nine key messages for a strong future Cohesion Policy. Enrico Rossi, President of Tuscany Region and Vice-President of the CPMR, will also be speaking at a dedicated high-level Cohesion Alliance event, being held at the CoR from 17-00 – 18-30 on 11 October to increase the political visibility to the initiative. The event will provide an opportunity to discuss some of the key ideas which emerged from the Cohesion policy workshops, held during the Week of Regions and Cities.